The most “wonderful time of the year” isn’t always so wonderful if you overspend. And it can happen to the best of us. Retailers start plying the public with their Christmas wares pre-Halloween, for good reason. People spend more during the holiday season than any other time of year. And this year, according to the National Retail Federation, retailers expect consumers to spend an average of $967 per person. But all that spending comes at a cost. Even more than being uncertain about gift choices, running out of time or worrying about their health and waistline, 47% of people say that their biggest stressor when it comes to the holidays is the financial outlay required. Stressing out and spending too much can happen to anyone. But knowledge is power, and planning ahead can reduce the likelihood of a lot of unwanted bills in January. Here are 7 tips to help. Budgeting is a must. Come up with an overall budget, then divide it up. Let’s say your budget is $1,000. You can break that up into smaller chunks–like $300 on the kids, $200 on your wife, $100 on your mom and so on. This can make it less likely that you’ll keep on buying and splurging after you’ve reached your target for each person (or going into the red, getting into debt or tapping into savings). Sticking to your budget takes great discipline, and don’t forget the extras. Be sure to put in line items for the little things—which sometimes aren’t little at all. Like holiday parties, hostess gifts and fancy clothing expenses. Potlucks and Secret Santa parties. Expensive dinners out with friends, or at home with the family. Charitable giving. Think things through when you’re budgeting. You won’t stick with a budget that’s too tight or unrealistic, and you may get frustrated, throw the budget out and overspend as a result. Consider a line item for the unexpected or forgotten. Finally, keep in mind that the only way you’ll know whether or not you’re staying within your budget is to track your expenditures. Keep a spreadsheet, or use an app. Keep your receipts in marked envelopes. Whatever system you choose, keep it up-to-date and check it often. After you’ve created your budget, be sure to shop with a list in hand. Remember, even though the holidays are all about generosity, that doesn’t mean you need to get a gift for every person you know. You can choose to buy gifts only for your family or closest friends, while opting for a party or simply spending time with other people. Have conversations in advance, decide on a holiday exchange with a budget limit, have a white elephant party or draw names. Don’t feel bad about making agreements with others—they’ll probably be relieved that expectations have been set. Shopping for bargains doesn’t mean hitting every Christmas “sale,” which can lead to temptation and impulse-buying. Good deals are not always about Black Friday. The best way to get good values for your dollar is to start early, following your budget and your list. You can always comparison-shop digitally using an app or Google. Don’t make the assumption that just because a retail store or salesperson, website or TV ad is pushing a “great deal” that it’s the best price you can get–do your own research. Keep in mind that you don’t have to purchase all the gifts you give. Handmade items can be a great alternative if you are crafty and get started early. Cooking homemade treats is always a great option, too. Christmas cookies, flavored oils or vinegars, fudge or peanut brittle are festive and thoughtful. You can also create custom “coupons” for things you know someone would really appreciate. You could offer to babysit for an exhausted couple, do yard clean-up, provide photography or video services, or organize a garage or closet. Consider paying with cash to avoid any adverse scenario and keep spending in check. Forking over actual bills can really change your decision-making process in a store. 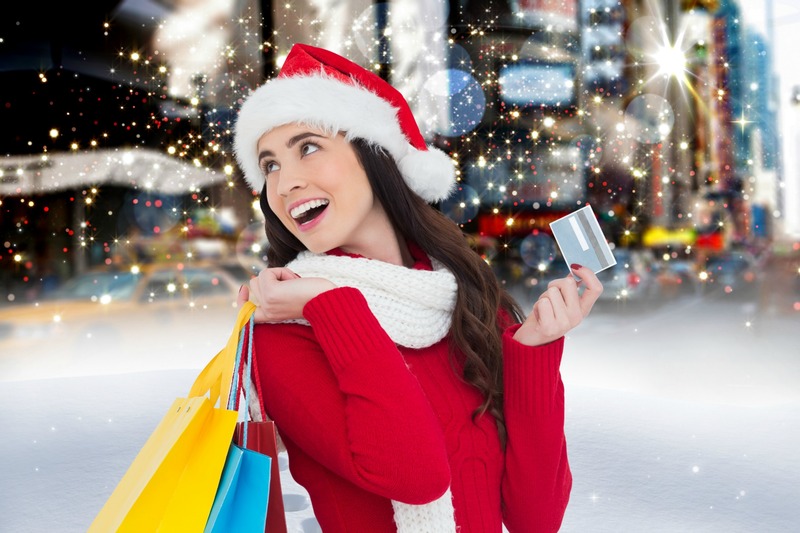 If you are a responsible credit card user who pays off your balances every month, you may want to use a credit card which pays you cash back or earns great travel rewards for your holiday shopping. But keep in mind, if you charge an amount which exceeds 30% of your credit limit, you could lower your credit score inadvertently. For the most part, say no to opening up “special discount” retail store cards. Their high interest rates and late fees can negate any savings if you can’t pay them off immediately, and having too many open accounts can affect your credit. If you’ve always hosted the elaborate holiday dinner for 20 people at your place in the past, you may want to change the format to potluck and save hundreds of dollars. If you have dozens of extended family members, you could each pull one name out of a hat and handle the gift-giving as a “Secret Santa” experience instead. You could purchase items for a local charity in lieu of buying gifts for every extended family member. Getting your children involved in picking out badly-needed necessities or toys for the less-fortunate can be a joyful and irreplaceable experience. You could bake treats for neighbors, assemble care packages for armed forces members or participate in coat, toy, canned goods or blanket drives for the homeless. You could tour the best neighborhood Christmas lights, go sledding, attend a high school performance or go caroling. You could watch your favorite holiday movies together while enjoying popcorn, gingerbread cookies and hot chocolate. Remember that traditions don’t have to be expensive to be cherished. Let’s face it, having a pumpkin-spiced coffee drink every day can really add up. Decide to have one each Friday instead, then put the money saved toward your Christmas gift budget. By planning ahead and deciding which splurges really matter to you, you can save a lot, gain control and feel much less stressed out. Enjoy a wonderful holiday season with abundant blessings! Questions? Contact Alpha Beta Gamma Wealth Management in Florida.